How can we best extend public library opening times? We do not yet live in a society which can fund opening for libraries 24/7. 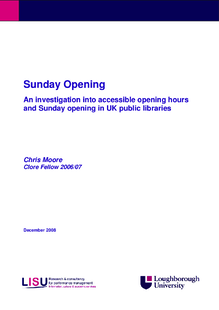 This detailed report examines opening hours with special reference to Sundays. The research sets this in a context of current social, economic and political developments and highlights a set of critical success factors and helpful practice.